The author writes from the perspective of "the other European" (from Eastern Europe) and "the other American" (an immigrant). She came to the States from Poland at a time when it was still dominated by Soviet-style Communism. In her new country she transformed herself from a scientist to a writer. These essays and poems take the reader on a journey through space and time addressing issues of identity, alienation, belonging, and responsibility. Sometimes funny, sometimes tearful, but always thoughtful, this book charms and provokes. 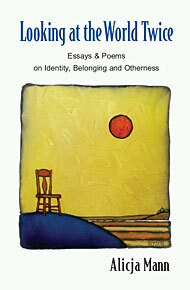 It invites the reader to sit and reflect, as symbolized by the art on the cover. Alicja Mann is a writer of creative nonfiction who divides her time between Tucson, Arizona and Cape Cod. Born and educated in Poland, she immigrated to this country in the 1970s. She made her home on Cape Cod, and worked for several years as a scientist, translator, and mother. After becoming more comfortable in her new country and new language, she left science to pursue a writing career. Her social and political commentaries, feature stories, and personality profiles have been published in regional and national magazines, including the Cape Cod Times, Cape Cod Life, In These Times, and The New Leader. She is a former op-ed columnist for the Cape Cod Times and co-author of Son of Mashpee, a book dedicated to the Wampanoags, their heritage, and culture. 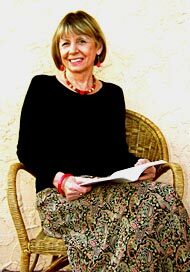 In Tucson, she worked with the students of Arizona International College as the mentor of book arts. Besides writing, she devotes considerable time to photography, design, and publishing. She loves classical music, jazz, gardening, and hiking. Word Studio specializes in writing, designing, and publishing for the local community. It focuses on works that are of a reflective, personal nature, and produces books that are artistically designed with high quality printing. Other publications by Word Studio include Son of Mashpee, The Onset Review, Undaunted Tales and Champagne Wishes. Word Studio is located in Tucson, Arizona and Falmouth, Massachusetts. Go to Word Studio Publishing. ©2009 Word Studio. All rights reserved.